So little good new music, so much time to listen…. Strike that, reverse it. I am genuinely surprised at the amount of enjoyable albums coming out in 2015, many by groups that I’ve never heard before. Last month we discovered 6 newly-released ear-tapping recordings and now, to make an even baker’s dozen, we present 6 more in what I like to call: Best Music of 2015 Part Deux. This album features fabulous hard rocking versions of covers, including My Generation, Jeepster and Whole Lotta Love. The band is led by Alice Cooper (yes, that Alice Cooper), Joe Perry (yes…) and Johnny Depp (aye). Individual songs employ many other big name musicians such as Paul McCartney and Joe Walsh. I did not expect this release to be my bottle of pilsner, but these creative versions of beloved songs make my brain tingle in all the right places. 3 stars. Out of 3. Richard Thompson, although not a household name, is certainly one of the greatest guitarists alive. He also writes stunning songs and has a memorable and perfect voice. Rocking for over forty-five years, he puts out another great album with Still. Thompson’s music includes Gaelic influences and a bit of folkishness, but he rocks away as needed. Discover him and then check out his extensive back catalog. 2.5 stars. Out of 3. Rhiannon is the female member of Carolina Chocolate Drops, an old-timey hokum string band. She sports an amazing voice and with this solo album expands genres to include hip-hop, blues, and more. If you like a strong female voice, check this one out. 2.5 stars. Out of 3. Butler sings/sang/sung for Arcade Fire, who hit their pinnacle a few albums back with Neon Bible. And since I haven’t enjoyed their new stuff so much, I had no expectations for Butler’s solo outing. Quelle surprise! Featuring music that is surprisingly different from Arcade Fire, Butler delivers an enjoyable album that is strong from start to finish. Styles range from good old-fashioned rock and roll to quirky 80s rock, and beyond. Nicely done, Mr. Butler. This is an excellent effort that breaks away from the shadow of an established band and creates a personal voice. 3 stars. Out of 3. A bit more delicate than my typical listening fare, The Decemberists deliver dreamy, subtle indie/folk/rock. This Portland group has averaged one album every 2 years since 2002, so their catalog is already deep and impressive. If you’re looking for a quiet, feel-good experience, you could do worse than What a Terrible World. 2.5 stars. Out of 3. Hard to believe these lads have been around since the early 80s. Although their music inhabits a wide variety of styles, TMBG have a distinct sound, largely defined by the lead singer’s unique voice. As usual, songs contain weird weird lyrics, are often strangely child-like and boldly go where one does not expect. If you like past albums, you’ll probably groove to this one as well. 2 stars. Out of 3. There you have it, a veritable potpourri of aural pleasurefulness. So get ready to drop the needle on that platter and crank the attenuator to twelve and beyond. 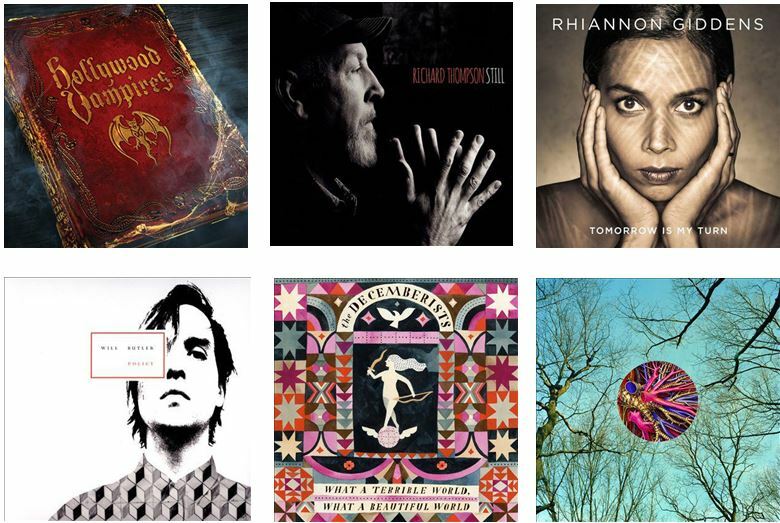 This entry was posted in Music and tagged best of 2015, hollywood vampires, new music, rhiannon giddens, richard thompson, the decemberists, they might be giants, william butler by Ron. Bookmark the permalink.